I have always believed that Canadians in times of conflict have represented themselves and their country proudly in the battlefield. When I came upon "Show No Fear, Daring Actions in Canadian Military History", I knew it was a must read. 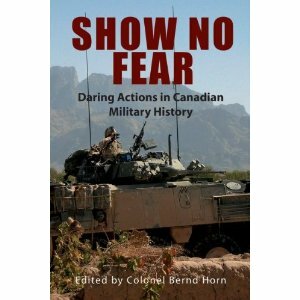 "Show No Fear is a collection of essays that captures the richness of Canadian military history. Although Canadians see their nation as a peaceable kingdom and themselves as an unmilitary people, the truth is that Canada has a proud military heritage. Moreover, the nation’s citizens and their descendants share a legacy of courage, tenacity, and warfighting prowess. This volume of daring actions showcases the country's rich and distinct national military experience while capturing the indomitable spirit of the Canadian soldier. Actions studied include military bravery in the Seven Years’ War, the British attacks on Fort Mackinac and Fort Detroit in the War of 1812, the Lake Erie expeditions during the American Civil War, courage displayed at Paardeberg in the Boer War, trench raiding in the First World War, bold valour in the ill-fated Dieppe Raid in the Second World War, toe-to-toe fighting with the Chinese in the Korean War, and present-day heroics in Afghanistan." The book is a very good read in many ways but a little uneven. I found way too long the first chapter describing the training and use of Rangers in military action. All the other chapters were well written and very interesting, except for the chapter on the lake Erie Expeditions. Britain and Upper Canada were trying to maintain neutrality in the American Civil War and the actions involved were the Southern States attempting to bring the war to the Union on Lake Erie. This was their actions and really did not involve Canada. Except for this and the first chapter, the rest of the book was very enjoyable. I wish there had been maps, though. Maps are essential in any book which tells the story of a military action. It helps better set the scene for the reader. My favorite chapter was "Jump into Chaos", which tells the story of the Canadian paratroop force who invaded France from the air the night before the D-Day invasion. I would recommend this as an entertaining and educational read. When I was done, I again wondered if I would ever have the courage to do what those in this book did. Fortunately, I never have had to find out.